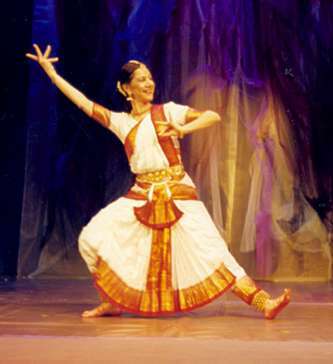 An ancient Indian and contemporary alternative dance art, of multicultural scope. An artistic method of healing and spiritual awakening. "For me dance is not only the art which expresses human soul through movement, but most of all the basis of a complete worldview which is more free, more harmonious, more natural"
Bharata Natyam is an ancient theatrical dance form which was developed in South India, comprising a theatrical essence into its technique. Its name could be translated as "the art of mankind". It includes theatrical expression (BHAra), melody/poetry (RAga) and rhythm (TAlla). Dance, Music and Theatre were, in ancient India, the three folds of the same art, called "Natyam". 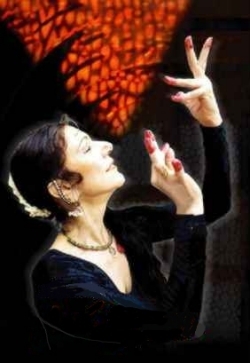 An art which blended rhythm and dance dynamics with melody and with the poetic expression of the "gestures", called "hastas" or "mudras", and the expression of every muscle of the face, creating thus a fully theatrical experience. The dancer is also a storyteller: he narrates a story - usually taken from the ancient Vedas and mythology - through a complex hand language, a language which communicates effortlessly with all the different language communities of this immense country. In a solo performance, the dancer impersonates two or more characters, alternating facial expression, movements and mood. Krishna, his jealous wife Satyabama and his sweet wife Rukmini , for instance, can be played onstage by a single performer - who has to know then how to become a man, a woman, a child, an elderly person, a god, a daemon, an animal and a mythical creature. Bharata Natyam is one of the very few extant dances today which blend in such a way all the elements of a complete theatrical experience. Bharata Natyam is one of the very few dances left in our days, which combine to such a great extent all the elements of a full theatrical experience. This Indian art, close to the ancient Greek orchestic arts of the Muses, "Musike", offers the contemporary artist a model of whole inter-artistic and inter-cultural expression. The existence of this ancient art is a revolution for the West. It's a novel view on what art is, opening new vistas and new goals for the moving body, including in its movement language some areas unknown to Western dance, such as eyes, fingers, the face, the joints, emotional states and the poetry inherent in dance poses and "moving immobility", on the edge between dazzling rhythmical tempos and the complete abstraction of pause. The charming, elaborate movements of Bharata Natyam are delicately elegant and dynamically earthy: they impress the senses and the emotions, going beyond the boundaries of place and time. A dance of high aesthetic value, it sings Life and Nature, restoring to the dancer the means to discover his/her lost identity as a creature of nature, the deep connection with his/her humanity, emotions, moving inner energy, mystical union with the Universe and its forces. Dance is not a spontaneous emotion or idea, translated into movement: it is a ritual, painstakingly studied and structured. It is closely related with the spiritual development of human beings, and a way to find divinity inside us. This dance is much more than an alluring art. It is, for the contemporary Western person, the priceless key of a forgotten knowledge which can offer a mighty help on the path to self-knowledge and of the development of body, mind and soul. • It helps to balance and harmonize of the two brain hemispheres and the fullest exploitation of the mind's potential. • It creates connections with parts of the body we normally don't use separately and with control - as, i.e., the fingers, the eyes and the joints. • It helps the creation of a "body image". • It helps in localizing and consciously feeling the body's energy centres, so that the energy field becomes elastic, strong and healthy. • In many primeval cultures, rhythm is used as a therapeutic medium, according to the belief that many illnesses are the result of "broken internal rhythms" . The attunement, during the dance, to external rhythms of drums, has the effect of normalizing the internal rhythmical processes, resulting in a harmonizing of the whole personality. • As the artist "speaks" with his or her hands, the fingers transcent their daily role as tools of grasping and doing, and are transformed into expressive tools of energy. Through the fingers and the palm, it is as if the artist handled and re-created the energy sphere around the body. • Moreover, as hands take the place of words, the gestures become symbols through which the artist approaches pre-lectic memories, reaching thus very deep recesses in the inconscious. • On a body level, this dance strengthens reflexes, enhances coordination and stamina, invigorates the heart and the respiratory system. The contact of the naked feet on the ground bestow energy, while their energic stamping invigorate all the body organs. • After the performance, the dancer feels an intense and deep rejuvenation, accompanied by an expanded feeling of his/her presence in physical space. This ancient dance, created and evolved in a far-away country, has a scope and a great importance to us, contemporary Western people. It deserves to be rediscovered, so that each one of us can personally benefit and get to know its wondrous effects on the body, the mind and the soul.